Bishop John Doaninoel was described as an important and a powerful Marist figure in the Church in Oceania. Yet he was very quiet, gentle and very kind. He was not one to complain; you found out that he suffered from malaria only when it was time to rush him to hospital! Nor did he brag about his achievements. He walked the talk, but in a quiet and unassuming way. That’s how he earned the respect of all. Pope St John Paul II once said that, ‘What the world needs today are ministers of the Gospel who are experts in humanity, who have a profound awareness of the heart of present-day men and women, participating in their joys and hopes, anguish and sadness, and who are at the same time contemplatives who have fallen in love with God. For this we need new saints.’ I believe John was like that. 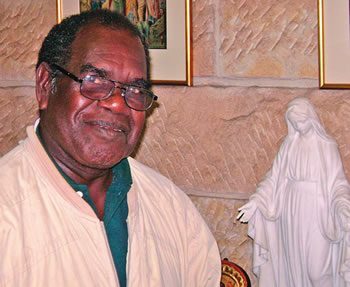 During the Bougainville Crisis which raged for 10 years from 1988 – 1998, John was taken prisoner by the Bougainville Revolutionary Army, falsely accused of helping the national government in Port Moresby. John, as regional superior, had been caring for the regional house in Kieta which was burnt down. He was taken prisoner by the people in the Kongara area near Kieta. The Kongara area is not Catholic. He was roughly treated in the beginning but later was given more freedom. John said of them, ‘they were very strong-headed, simple, uneducated and I could not talk sense into them’. During this time he had no contact with Marists and was really in need of medical attention. Towards the end of the civil war John was allowed to minister in the surrounding mountain villages, making it possible for the children who were deprived of school during the crisis years to make their First Communion. During the time of imprisonment John suffered a great deal, yet was the rock which kept the Marists together. What was the secret for John’s kindness, gentleness, unassuming presence, compassion and endurance of pain and sufferings? A former bishop of Bougainville, Bishop Henk Kronenberg, said, ‘John was a priest who took his prayer life seriously.’ I believe that was John’s secret -- a deep, intimate personal relationship with God in prayer. Was John a powerful and important figure for the Church in Oceania and for the Society of Mary? He was said to be weak, gentle, too quiet, not bright, and inefficient -- hardly the signs of a powerful and important person. But St. Paul reminds us that human weaknesses and inefficiencies are the arena in which the power and strength of God is revealed and made manifest -- and there lies exactly the power and strength of Bishop John. May Mary, our Blessed Mother, who made a gracious choice of you, Bishop John, lead you to the eternal joys of God’s Kingdom.